“Explainer” video doesn’t explain, it distorts. We love short, animated explainer videos. They entertainingly and quickly reduce complex issues to their simplest possible terms. The problem is they sometimes overshoot the mark and, instead of the simplest possible terms, they instead present issues in ways that are something less than simple. 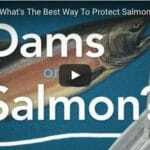 That’s what we get in the new EarthFix video, “Dams or Salmon?”, which is devoted to the question of whether four lower Snake River dams should be removed in order to restore deeply depleted salmon populations. The video begins by asking, “If you had to pick between dams or salmon, which would you choose?” making the issue an “either/or” from the get go. Never do the producers seriously entertain the notion that there might be a dam removal solution that would both restore salmon populations and meet our economic and electrical needs with clean energy. That conclusion follows a homily on the virtues of the dams. We are told the four lower Snake River dams “help control floods”, that they generate “enough carbon-free electricity to power Seattle”, and that “they also make it possible for ships and barges to reach Lewiston, hundreds of miles inland from the Pacific Ocean”. If you’re waiting for a similar paean to the virtues of salmon, you’re out of luck. Apart from serving as food for orca whales, the fish seem to have no virtues that the producers think worthy of mention. Not if we’re to go by what we see here. That’s the problem with the video. It simultaneously exaggerates the benefits of the four lower Snake River dams while ignoring the economic and cultural value of salmon and it dismisses nearly entirely clean, affordable, and reliable options for replacing the electricity generated by the dams. Contrary to what we’re told in the video, the four lower Snake River dams provide no flood control. They are “run of the river” dams. The dams provide “enough carbon-free electricity to power Seattle” only briefly in the spring when power demand is low and other resources are readily available. The ability of barges to reach Lewiston and points along the way is a rapidly diminishing benefit reflected by the fact that barge traffic on the river has declined by 70% in the last twenty years in favor of more effective forms of transport such as rail. But, the most salient point is that the electricity generated by the dams can be affordably and reliably replaced by clean resources including wind and solar, as described in the 2015 white paper, “Restoring wild salmon: Power system costs and benefits of lower Snake River dam removal” by Steven Weiss. That’s why a federal court judge who, unlike the video producers, examined all the available facts, concluded that the Bonneville Power Administration, the Army Corps of Engineers, which owns the dams, and other federal agencies, should conduct a now ongoing environmental impact study that fully considers removal of the dams as a possible solution for restoring salmon. According to Youtube, the “Dams or Salmon?” video has so far received two hundred ninety-four thousand views.